Sereno #4 SOLD! at SIMA's Waterman's Ball, 2015. Happy to help such a great charity event! Click on the image for coverage on the Waterman's Ball, 2015. 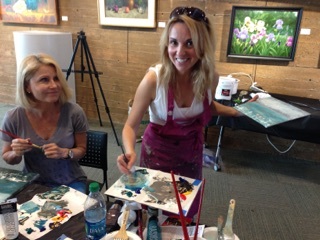 Having fun at my mixed media workshop held by the San Dieguito Artist's Guild at the Encinitas Library. Happy to be back! "Rhythm" on display at Art Hamptons and Art South Hampton with the Sergott Contemporary Art Alliance! At the Sergott Contemporary Art Alliance VIP show with my work. Proud to be selected for the TAO Pop Up Studios! Click here for more info on TAO! "Sunset/ Puesta del Sol" SOLD to support the Surfrider Art Gala, 2015! Happy to be part of such a great cause! Teaching my workshop at the Encinitas Library on Feb. 15th. SO much fun! "Blue Mind" Opening Reception @ the Encinitas Library, Saturday, Jan. 17 from 2-4pm. Exhibition runs through Feb. 9th! Click Here for Coverage on the show!